A convertible to take note of? Asus already had a little Chrome news at IDF today, and now it's out with a brand new convertible to boot. The Transformer Book T100 stows a Bay Trail Z3740 quad-core processor from Intel inside its 10.1-inch frame. 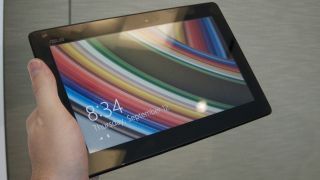 Running Windows 8.1, the T100 weighs a slim 2.4 pounds in "ultraportable" mode (as a notebook) and 1.2 pounds as a tablet. According to Asus Chairman Jonney Shih in a statement, the T100 brings "enough battery for all-day computing," a hallmark of Intel's latest line of processors. In numbers, the machine can purportedly last up to 11 hours. The touchscreen is detachable from the keyboard dock, providing the portability of a tablet when users want to switch out of laptop mode. The new Asus device also features USB 3.0 on the dock, microUSB, microHDMI and microSD. Asus packed 2GB of RAM in the T100, and users will be able to choose between a 32GB and 64GB version. The IPS display hits 720p with a 1366 x 768 resolution. U.S. customers can start taking the T100 to task on Oct. 18 at a price of $349 and $399 for each storage model. Asus didn't provide availability for other markets, but converted prices amount to about £220/£252 and AU$373/AU$427. Google and Haswell meet at last.